Eleusine indica.Bobby Hattaway. Discover Life. www.discoverlife.org. (Accessed 5/2014). Eleusine indica is a summer annual, C4 grass (Downton 1971), from fibrous roots; stems flattened, usually in a mat-like rosette, spreading to sometimes upright, 30-60 cm long, branched from base; sheaths flattened, whitish, hairy on margins, with a tuft of hairs on either side at top; ligule membranous, 0.1-0.2 cm, split down center. 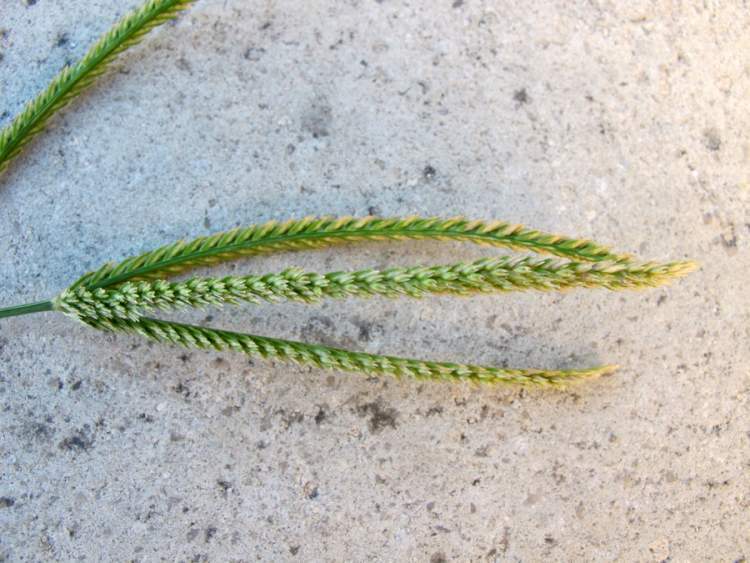 Eleusine indica stem and leaf sheaths. By Joseph DiTomaso. Copyright © 2018 CC BY-NC 3.0. www.bugwood.org (Accessed 4/2018). 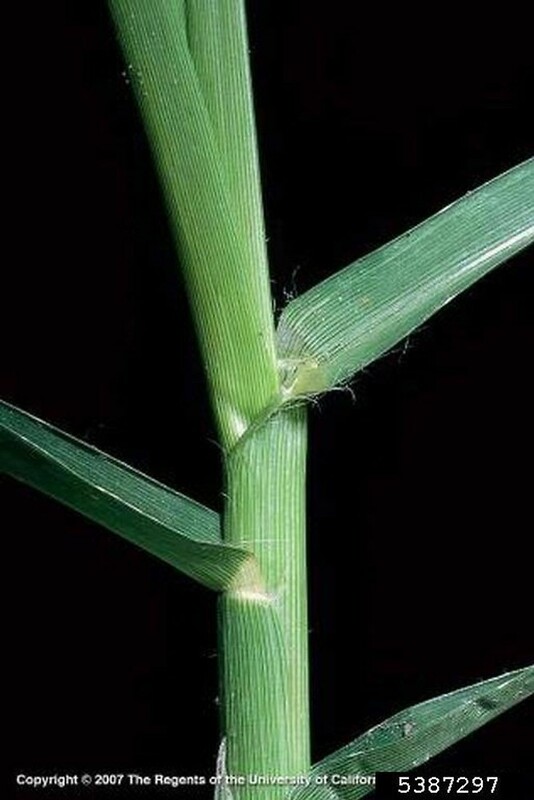 Leaves rather wide, coarse, 5-20 cm long, 0.3-0.6 cm wide, folded along midrib, smooth, base of blade white around ligule. Flower spikes, 4-10 cm long, 0.5 cm wide, with fine, regularly toothed, zipper-like profile, spikelets several flowered, flat, in 2 rows (zipper teeth) along one side of rachis; spikelets crowded, about 0.5 cm long, 3-6 flowered; inflorescence of 2-8 one-sided, flattened spikes, radiating from top of inflorescence stalk; blooms July-Sept.
Eleusine indica inflorescence branches. Photo by Pancrazio Campagna. Luirig Altervista. luirig.a;tervista.org (Accessed 4/2018). Fruit dry 1-seeded. Fruiting inflorescence persistent into winter. 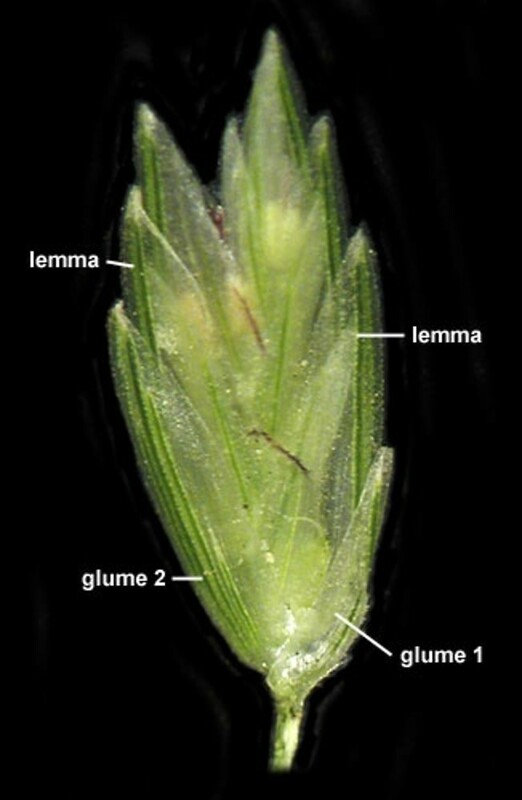 Eleusine indica spikelet labeled. By Anna Gardner. Copyright © 2018. Ada Hayden Herbarium – Iowa State U. New England Wild Flower Society. gobotany.newenglandwild.org (Accessed 4/2018). 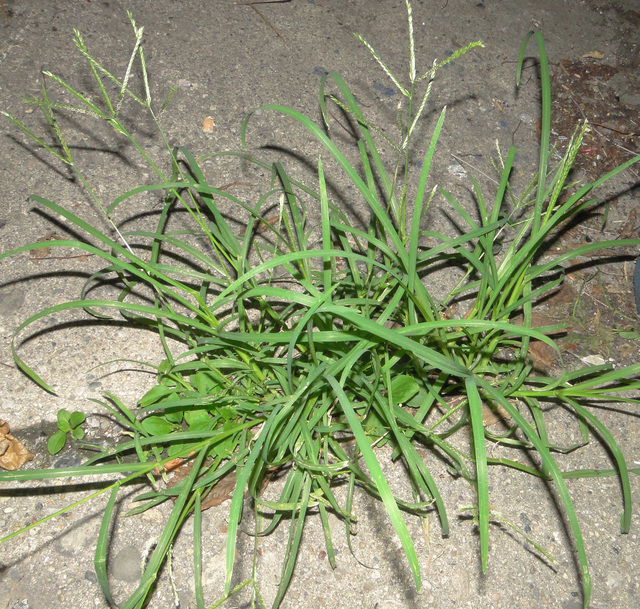 Habitat: Ubiquitous summer weed on any open, disturbed soil, sidewalk cracks, around street trees, curbs, edges of lots, vacant areas. Notes: Soon shaded out in undisturbed habitats. Tolerant of mowing, drought, and soil compaction (Uva et al. 1997). Intolerant of shade. Appearing similar to Digitalis sp. but leaves of E. indica strongly folded along midrib.